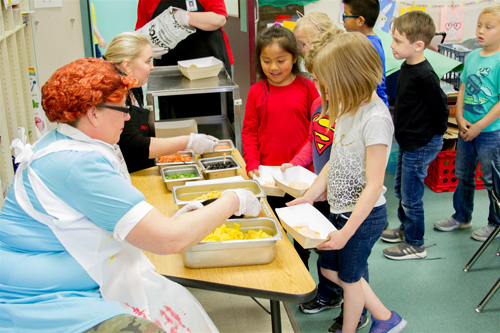 Food services staff visited Kindergarten classes at Woodland Primary School to teach students how to make their own salsa as part of the Chef in the Classroom program. Cris Forgey and Judi Lute, Woodland Primary chefs, along with Laura Perry, our Food Services Director, visited the classes during the students’ afternoon break time. 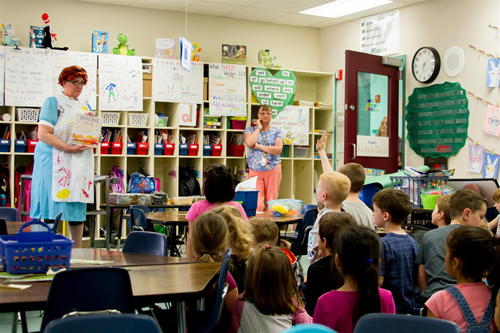 The trio read students a short book called “Dragons Love Tacos” and taught students about salsa. Cris even dressed up as her alter-ego, Lunch Lady Mildred, to make students’ breaks a bit more exciting. 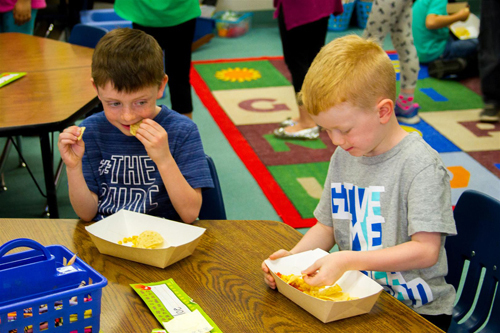 For their afternoon snack, students selected from a variety of salsa ingredients including tomatillo (sauced tomatoes), tomato cuts, corn, cilantro, black beans, onions, mangoes, and even pineapple to put on tortilla chips.